Tatu City has hosted a team of urban planning experts from the International New Town Institute (INTI) to develop a strategy to connect precincts and activate over 1,000 acres of green spaces at Tatu City. 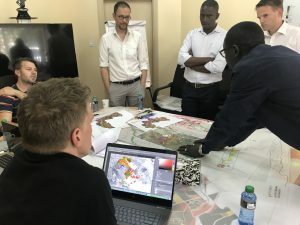 INTI guided the Tatu City team and renowned Dutch experts through a 5-day New Town Lab, a rapid urban planning workshop to brainstorm ideas, analyse existing plans, give insights, and develop strategies that can be fully implemented. The resulting strategy, termed as “the city in between”, aims to connect Tatu City’s various projects – schools, homes, businesses, recreation facilities, shops and a manufacturing area – to each other, as well as to its surrounding communities. Tatu City has dedicated over 30% of the city to open spaces for everyone to use, making this lab a crucial element of building the city. Using first-hand research as an entry point to this lab, KUWA, a Kenyan-based urban design and planning consulting company and local partner of INTI, explored the local context in depth. Speaking at the conclusion of the workshop, Nick Langford, Kenya Country Head for Rendeavour, owner and developer of Tatu City, said that the firm had embarked on a robust programme to understand best industry practices and use them as a benchmark for the development. “We are keen to focus on building a cohesive city that embraces not just our residents’ use of public space, but also the use by communities living around Tatu City. Our partnership with INTI ensures we will adhere to the highest levels of planning to make that a reality,” he said. The New Town Lab Tatu City is co-financed by the Creative Industries Fund NL and the Netherlands Enterprise Agency (RVO). The international experts who participated in the workshop included Markus Appenzeller (MLA+), Michiel van Driessche (Felixx landscape architecture), Rachel Keeton (Delft, Technical University), Remco Rolvink (DASUDA), Jaakko van ‘t Spijker (jaakkovantspijker), Simone Rots (INTI) and Zahra Kassam (KUWA). Together with the representatives of Tatu City, the experts form a multi-disciplinary team that worked together on the issues of a new planned city.